Okay, you've hit ChrisBlackburn.com. But you may or may not be sure just which Chris Blackburn I am. You're thinking, "What? You mean there's more than one?" Sadly, yes. There are probably several hundred Chris Blackburn's in this fine world of ours. Some are amazingly cool people, yet some are complete embarassments - not only to the name, but to humanity itself. You're thinking, "Wait, you can't be serious." Nope - it's all true. When I was a kid, there was another Chris Blackburn who went to the same doctor as I did. They got our charts crossed on a regular basis. Made for some fun times. "So, Chris, how's your arm doing?" "My arm? Uh, fine? Should there be something wrong with it?" A soccer player. I do not play for the Chester City Football Club. A fisherman. And I've never been to Alaska. A country music singer. Yes, I sing. No, I do not sing country music. Live in Massachusetts. Yep, there's a guitar-playing Chris Blackburn up there, too. But I am not he. And I've never written reviews for YourSound.com. Have a skateboard park named for me. Sadly, my namesake passed away, and the park was named in his memory. Speak Spanish. And I've never been to Texas A&M University. Teach ninth-grade English in Ithaca, NY. Belong to a photographic society. I don't even own a camera. Tab songs. I've played guitar for a long time. But I've never had the patience to write out tablature. Care if women breast-feed in public. Seriously, that guy needs therapy. Oh, and I've never used WebTV. Played bass in a band called Coexist. 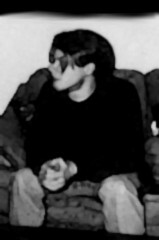 I did play bass in a band at one point, but that was in 1994-5. Worked at McCann's. He only lasted four months. Ouch. Okay, okay, enough already. This is who I really am.